I let the truth of those words sit between God and me for a while. I refused to take them back. They were out there and the ball was in His court. I waited for Him to toss encouragement, peace, or guidance my way. But nothing. His response was silence. Discouraged, I left God and crawled back into bed. For a long time, I had been getting up early to read my Bible and pray. It was a habit that made me feel included among good, church-going folks. I checked it off my list and patted myself on the back daily. The Bible reading was easy. I like to study God’s word and even enjoy applying it to the particulars of my life. But, when it came time to pray…well, I was a mess. Regularly, moments into my prayer time, I would find my mind wandering. With intentions of praying for a family member, I would find myself planning dinner. Instead of praying for our president, I would be composing an email to a friend. While I was supposed to be praying for my marriage, I caught myself thinking about a movie we recently watched together. So, like a good American, I trusted in a little hard work. I hunkered down and read books, listened to sermons, and talked to friends. This resulted in my use of index cards, sticky notes, a calendar system, and a devotional. Though keeping up with all of this required organization and time, I was diligent. My prayer corner was just as cluttered as my ever-wandering, disobedient brain. And, even after all of my new strategies, I didn’t feel any closer to God. Honestly, the harder I tried, the more distant from Him I felt. My heart softened and my stiff neck bent to hear more. The heart-whispering stopped but the voices of the women were loud and clear. I noticed that their conversation wandered easily and naturally. I noted that each woman’s talking meandered to match her train of thought, and her friend had no trouble tracking her. The table between them was not cluttered with note cards, printed lists, or agendas. They talked of happy things and sad things. I felt His Spirit urging me to continue looking, listening and learning. So, I shifted my role from eavesdropper to student. I got scientific about my observations. At least once every thirty seconds, they even interrupted one another to give a redirection or encouragement. Within a span of five minutes, I counted eight different subjects: parenting, cooking, fashion, marriage, driving, school, weight-gain, and carpet cleaning. Making this tally count made me smile and reminded me of what I heard a speaker say a few years back, “A man’s thoughts are more compartmentalized, like a tackle box, and a woman’s are completely entwined, like spaghetti.” Yes, a spaghetti brain, I was. My time at the coffee shop was up, but God had made good use of it. As I drove to my appointment, I reflected on what I had seen, heard, and learned. God wants that kind of conversation, one that matches my spaghetti brain, with me. Could it be true that He would allow me to simply let my mind to wander in His presence? Perhaps my “Quiet Time” with Him could be free, natural, and uncluttered. Instantly, within my heart, picket signs were lowered and hope was raised. It was worth a try. The next morning, after my Bible reading, I stayed out of the covers. Instead, I imagined sitting across from God, like friends in a coffee shop. Here is where we could start. I was only strong enough for baby steps and God was with me. I clutched my mug, smiled, and sat with Him for a while. Then, I started talking. It felt weird at first, whispering to Him there in my living room, but I didn’t quit. I started talking to him about my children, but was then reminded that I had an important meeting that day…so I talked about that for a while. That led to some talk about what I was going to wear…which drifted to whispering about my body image…which evolved into other topics. He was tracking. In the pauses, I listened. His Presence humbled, yet liberated me. I let go of my agenda and waited to hear from Him. On that first day, I didn’t hear much, but over time my hearing improved. Some days were awkward, but I didn’t panic. Since I had invited Him to wander with me, I was no longer struggling to unravel my entwined thoughts. We meandered together, and I was beginning to understand the point. God wants me, spaghetti brain and all, to spend time with Him. The God of the Universe was willing to meet with me as a friend and allow me to be myself before Him in order to reveal that His love is personal. He encouraged me to be authentic and natural in His presence, so I could see my concerns, requests, and desires in light of truth. In these pre-dawn moments, I learned so much about myself, but more about Him. I’m still learning, and God is still meeting me. This humbles me, stoops me low, and I am changing. To be changed, to be made more like Him, to experience the joy of being known, yet loved…all of these things motivate me to fold my hands each morning and bend before Him. But what about my index cards, calendars, and devotions? Are they worthless? Only for tackle-box brains? How do I hold myself accountable to pray for my family? My pastor? My nation? God and I “noodled” over these questions one morning over coffee. He reminded me that He brought my husband’s tackle box thinking and my spaghetti brain together to compliment each other and compensate for each other’s weaknesses. I’m better because of this union. Was God suggesting that I also adopt a little tackle box praying? Secure in His love for my spaghetti brain, I was motivated to pursue this further. I dug out my tackle box praying tools and considered how to use them. Unwilling to sacrifice my “spaghetti brain” time with Him, I decided to try more focused praying during my daily routine. I posted sticky notes and index cards throughout my house, which prompt me to talk to my Lord about specific topics as I work on certain chores. My mind still wanders, at times, and I’ll never have a tackle box brain, but I am expanding my view and growing closer to Him by talking with him about broad subjects. God responded with love and grace to my quitting, pouting, and pride. In His perfect sovereignty and timing, He addressed my questions and smashed my stumbling blocks. I learned and changed. Even though I can’t see Him with my eyes, He gave me a visual by bringing those women to the coffee shop. He showed me that my requests, my agenda, and my calendar are not the point of prayer. Just like time spent with my husband or a good friend, the purpose for those moments is intimacy, trust, and growth. When I spend meandering time with Him, He reminds me of His unconditional love. When I practice focused prayer, He pushes me to grow and broaden my view. 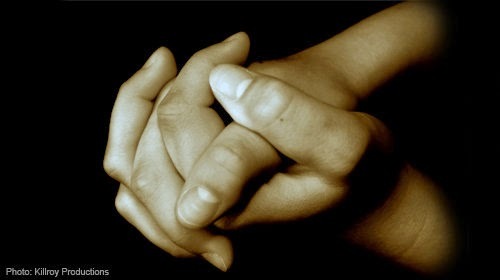 In both ways, by praying without ceasing, our relationship grows. What about you? Do you need some free, wandering time with God? Or, perhaps you could use more focused prayer disciplines in your life? Come out from under the covers and experience both, my friend, and you will find Him, who is the God of everything, including spaghetti and tackle boxes.